It seems like an age old saga of woe and misery. 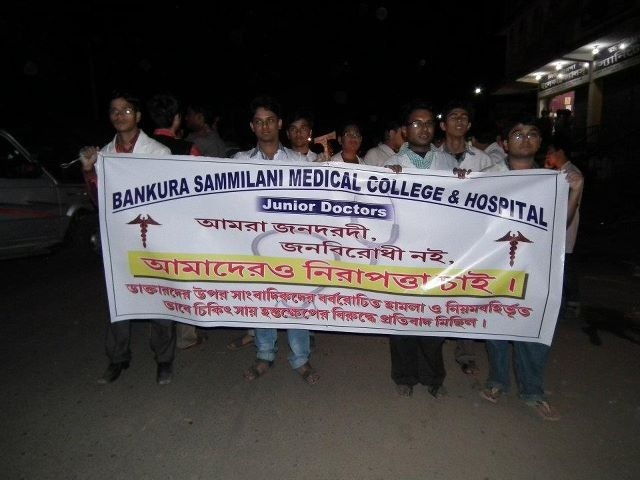 Once again the media and mob seem to have ransacked and attacked on duty junior doctors in Bankura Sammilani Medical College, one of the premier teaching tertiary care hospitals in the state. Although at the outset I must admit that I have heard of this event through some of my colleagues working there and hence I may be skimpy on the details, but still, it is a travesty of epic proportions when a doctor, and a junior one at that, gets attacked. During my House Officership a similar event had happened at my hospital, and I was privy to the events first hand and tried to make a vid-cast in order to spread some awareness about the event, since the morning after, the media painted the doctors in monotonous hues of evil. Admittedly not even a minute fraction of the population got to see our side of the story, still, it was our stand that mattered. It seems like in the BSMC case, the media persons heckled junior doctors and went to the extent of being abusive and misbehaving with the “female doctors” (I am very uncomfortable using this word couplet, makes me feel chauvinistic somehow) on duty. This is obviously not an event that could be tolerated in silence and hence the junior doctors went on a token ceasework to show their plight. 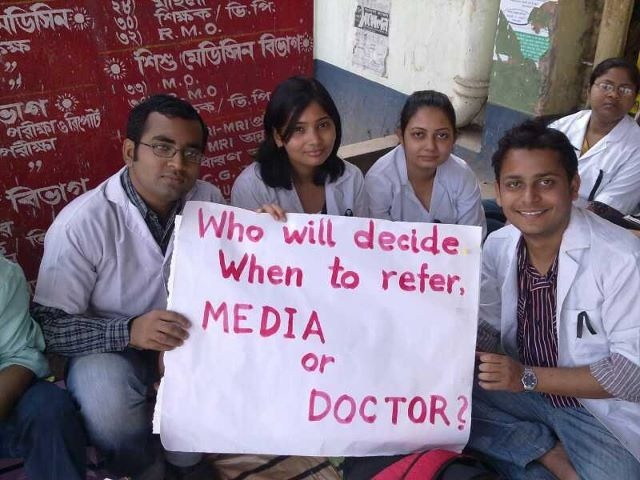 Now I am not a big fan of doctors striking work because I do not support strikes or bandhs of any kinds on principle. Be it a political party or a group of doctors, I think striking work sends out the wrong message. In fact it gives the media and TRP-hungry TV channels more fodder to demonize the doctors for dereliction of duty! However, when the media gets biased and presents only one side of the story, it becomes a rather difficult predicament because in that case the only way to make oneelf heard is to make a loud enough noise and unfortunately, the culture of West Bengal is that nothing works louder than extortion. And ceasework or strikes are nothing but democratized extortion. To the credit of the BSMC junior doctors, they also took out a candlelight rally in the post-duty hours when patient care would not be hampered. This is a move I whole heartedly support since this would actually bring to the notice of the common man the plight of the junior doctor. It is easy to get caught up in the wind sometimes for the general/lay public who do not know the trials and tribulations a junior doctor has to face. 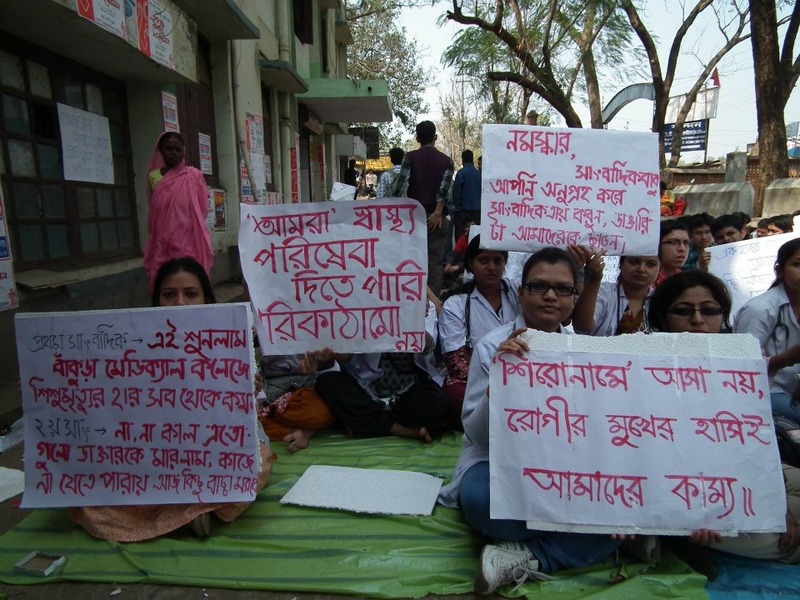 We have to work long hours, doing extremely menial jobs most of the time, earning a per hour wage that would put minimum wage laws to shame (in certain states – I must admit the situation is a bit better in West Bengal) – and also run the risk of getting lynched while at work. I had referred to the “culture of shame about errors in Medicine” TED Talk by Dr. Brian Goldman in a previous post, and I was very hopeful that those kinds of things could be implemented in our system as well. But unfortunately, this event kind of points it in our eyes that the culture of bringing errors in the open is an extremely risky proposition for the bodily safety of doctors. In most cases junior doctors get pulverized without any mistakes on their part, without any tangible evidence (aside from the expectations of an aggrandized mob) of negligence – I wonder what would happen if they started admitting errors upfront! To be honest most Indian ERs are run by interns or Junior Residents who are amongst the juniormost people in the hospital workforce, and most of the time the attendings are spread too thin to monitor all the decisions that they make. In such a situation errors are more likely to occur than not. Just imagine what would happen if one started advertising them upfront – not only would they become instantly unemployable for their radical honesty, they would stand a good chance of getting admitted in the very hospital they are supposed to take care of patients. In one of my previous posts I had waxed eloquent and romanticized the concept of working in a rural setting, but I must say I never considered this aspect of the story. We were lucky that we got “manageable” crop of patients but I wonder how we would be dealing with a stroke or TIA which could be very difficult to diagnose and treat without advanced imaging (asking for CT Scans in rural India is like asking for water in the middle of Sahara). In a system that is held up mostly with patchwork and is falling apart at the seams, the junior doctors are the life and soul of patient care. The least that one can do is show them the respect they deserve and treat them with some respect. After all, one must remember respect is a two-way traffic – don’t expect any if you are not ready to give any. Hat Tip: Thanks to Dr. Soumyadeep Bhaumick, ex-BSMCite and past Student Editor, JIMA, for bringing this to my attention. Tags: Defensive Medicine, Health Policy, Human Rights, Internship Stories, Junior Doctors, MedBlogging, Medical School, Medical Student, Medicine, postaday. Bookmark the permalink.